A sample of MCC Instructors who have taken the Greening Your Curriculum workshop and their modified coursework. We research and share what the automobile industry is doing to be more environmentally friendly. In terms of their product and how they manufacture them as well. We discuss the triple bottom line and how managers can make sure that they are being as responsible for the financial bottom line as they are the environment. What has been the response from your students? Positive. 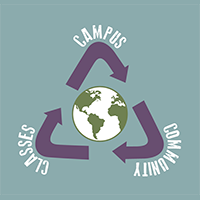 Students usually have no knowledge of the triple bottom line before the class and have shared the prior to the assignments they thought being environmentally friendly was just about recycling. Assignment: To complete this essay, you need to begin by finding an environmental issue or controversy that rouses your interest. It might be something you’ve experienced personally or something that you’ve seen in the local news. Your purpose in this paper isn’t necessarily to try to solve the problem but to argue for one side of the issue: to fully consider the issue and take a stand. Your thesis needs to make this position/stand clear to your reader. At the same time, you need to persuade your readers to consider your position and perhaps even to agree with it. In stating where you stand, do so in a way that explains why it matters. Ask yourself “so what?” Then, make that answer clear. List of Suggested Environmental Topics: Hybrid or electric cars; fair trade coffee or chocolate; paper-free campuses; plastic bag bans; organic farming; raw milk; blood diamonds; rising sea levels; or melting polar ice caps. Definition: “To pursue sustainability is to create and maintain the conditions under which humans and nature can exist in productive harmony to support present and future generations”. Participatory budgeting is a way of exploring and assisting local agencies in addressing environmental issues like conservation. In fact, two local government agencies in your area already have dedicated annual amounts to conservation issues in their budgets. A big box store has proposed building a retail space in a local area. However, concerned citizens have objected to this plan; the retailer has agreed to provide $100,000 per year for ten years to the municipality for “green” space in exchange for building in the area, which the city council has accepted. After your passionate speech to the city council and mayor, your town has agreed to allocate a specific amount of its annual budget to equity by using PB. However, since you are the person who advocated, the council has charged YOU with brainstorming and then presenting specific issues for which your town will apply this portion of the budget this year. This paper will require you to research local equity issues, choose which are worthy of investment, and decide how to best incorporate PB principles in service of equity. Assignment - What’s Your Carbon Footprint? Definition: Maintenance of resources for future generations. Relationship to Sustainability: Students will become familiar with sustainability by doing critical thinking about the problems presented in East St. Louis. The post-activity discussion will include a direct definition of sustainability and connection of the concept to the East St. Louis example. Students can self-assess as to level of critical thinking employed. Definition: Intentional plan for method of using resources that do not destroy or deplete the resources. This could mean using the resource without it being completely used up, or being able to continue to use the resource for a long time. Using mobile devices to reduce need for other devices and reduce the need for more sheets of paper. This will build awareness of sustainability in music and introduce new ways to use tools that the student already owns to help them with their music. Whenever possible, use rechargeable batteries (recording device, mobile device and camera), using a reusable water bottle. Students will be requested to use a reusable water bottle. Search public domain music sights for 3 pieces to play this semester. Use a tablet to open the PDF files and read the music from the tablet to eliminate unnecessary printing/paper. Definition: Sustainability is the planned use of resources in ways that provide environmental, economic and equal availability in the present and the future. Assignment: Investigate the resources that would improve the health and well-being of growing families residing in the city or town where you live. Please focus on information that would improve the health and development of pregnant women and their children. Consider whether these resources would be available to all and identify roadblocks that would limit their use.